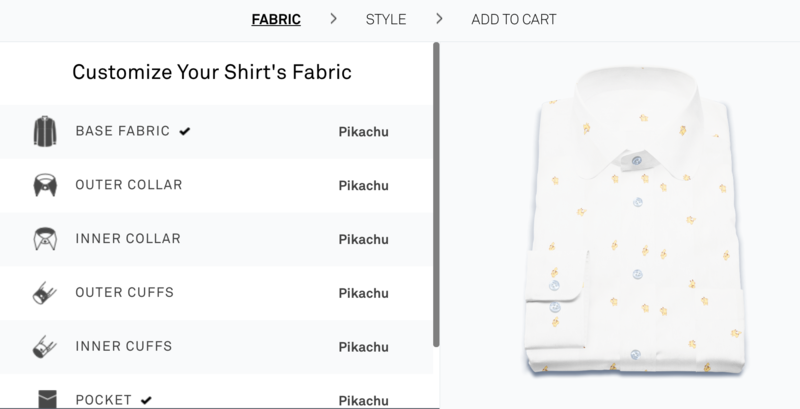 When custom dress shirt retailer Original Stitch teamed up with The Pokemon Company to produce fully-customizable shirts using beautifully detailed Pokemon fabrics, Poke-fans went wild! The San Francisco-based fashion startup teamed up with Japanese illustrators to design 151 original fabrics based on the original Pokemon found in the Kanto region. Original Stitch shirts are all made to order in Japan and are fully customizable with hundreds of ways to make the shirt your own! You can opt for a design with the Pokemon pattern covering the entire shirt, or you can experiment with fabrics on the chest, cuffs, collar, and pocket of the shirt. When designing your shirt, you aren’t limited to a single pattern either – if you want, you can create a shirt with up to seven different fabrics of your Poke-pals! And the customization doesn’t end there – with two lines for both men and women, you can choose from multiple cuts, collar options, and sleeve lengths to create a shirt that would make any Poke-fan jealous. Despite being a US-based company, Original Stitch is currently not shipping these Pokemon shirts outside of Japan. That means the only way to get your hands on one of these amazing shirts is to use a forwarding service or a proxy shopping service. That’s where FROM JAPAN comes in. Our proxy shopping service can help you get your paws on these shirts fit for a Pokemon Champion. 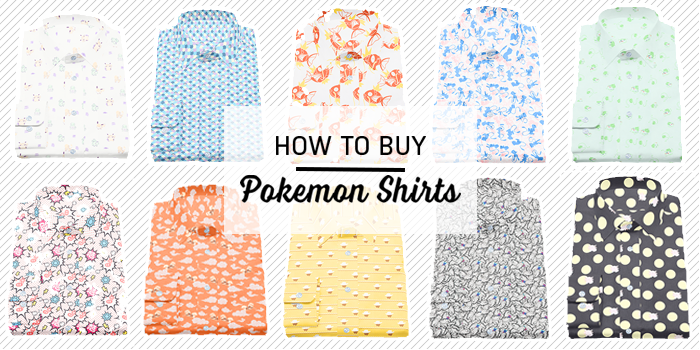 Read on for our in-depth guide on how to design and order your very own custom Pokemon shirt! Step 1. Go to Original Stitch’s Pokemon Shirt Webpage and make sure the site’s language is set to English. For ease of use, we suggest that you set the site’s language to English if it hasn’t been already. You should be able to switch the language at the bottom of the page. Step 2. Select the product line, shirt style, and size. All you need to do here is choose your preferred styles and size for the shirt. Unfortunately, Original Stitch doesn’t provide their size chart in English, so we’ve translated them for you here. For some styles of men’s shirts you will be prompted to give your collar and sleeve measurements, but you can skip this if you are unsure. Make note of all your fabric and style choices as you will need this when sending FROM JAPAN your order. Step 4. Create an account with FROM JAPAN and copy and paste the URL of the shirt designer page into FROM JAPAN’s search bar. Step 5. Hit search and complete the order form. 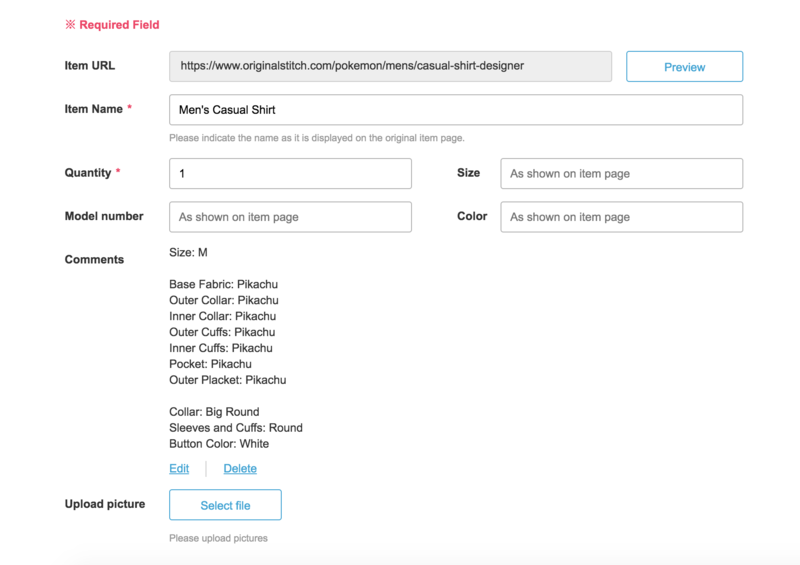 Item URL – Please copy and paste the URL of the shirts customization page and NOT the URL of your shopping cart. Our staff will not be able to see the contents of your cart. Item Name – For this section please write the item name as it appears in your cart. For example, “Men’s Casual Shirt”, like above. Quantity – Please specify the required quantity. If you wish to purchase multiple sizes or designs, please send us a seperate order form for each size/design combination. Comments – In this section, please specify your size, fabric choices, collar, sleeves, cuffs and button color like in the example above. Upload Picture – You can also send a screenshot of your finished shirt. Please make sure to double check all the details before sending your order to us. Once we’ve received your price quote request, our Customer Service team will send the invoice for the cost of the shirt. After Charge 1 has been paid, the shirt will be shipped to our distribution center. Once we receive the items, we will wait for your instructions regarding shipment. After you’ve notified us about your shipment instructions, we will send an invoice for international and domestic shipping and the fee for our Buyer Protection or Basic Forwarding purchasing plan. Then all you have to do is just have to wait for your Poke-tastic shirt to arrive at your door! Check out our usage guide for more details about our process and fee structures. If you have any further questions on how to use our service, our Customer Service team will be happy to help.